Macksons Paint Industries (Pvt.) 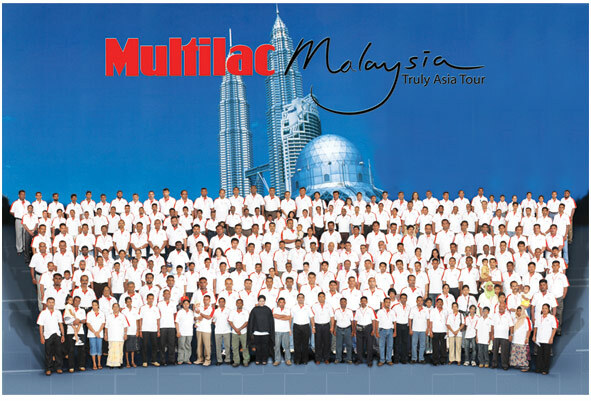 Ltd., manufacturers of the premier range of Multilac paints, rewarded 270 of their outstanding dealers and staff with an exciting tour of Kuala Lumpur and the Genting Highlands in Malaysia. Many souvenirs and surprises awaited the group, who were hosted at star class hotels and treated to interesting and informative programmes of culture and entertainment in Kuala Lumpur and the Genting Highlands. A cable car ride, visits to temples and monuments of cultural significance as well as numerous tours of the two cities made the four- day trip an exciting and fun-filled one. The group was also hosted to a Gala dinner at Crown Plaza hotel in Kuala Lumpur and entertained by Sri Lankan celebrity Sujeewa Karunaratnam and a cultural performance sponsored by the Malaysian Tourist Board. The dealers were unanimous in their appreciation of Macksons, for sponsoring the tour, “It was one of the most enjoyable and educational tours we have been on. We really enjoyed touring the city and eating the different foods. The shopping was fabulous and we bought many fascinating handicrafts and heaps of chocolates to bring home to our families,” they told the organizers “We really appreciate the time and trouble taken by Macksons to make our trip so memorable. This is a very thoughtful way of being recognized and rewarded for our commitment to making Multilac a household name in Sri Lanka,” they said. All dealers enjoyed the days spend with the management team of Multilac as our family and would remember the tour in the years to come. Multilac wishes to thank His Excellency Roshi Ismile High Commissioner of Malaysia and Nor Akmad, 1st secretary of Malaysian high commission for arranging the group’s visas within a short period of time and also for organising a cultural show for entertainment and souvenirs in Malaysia. Macksons Paints Lanka Pvt. Ltd is Sri Lanka’s largest paint exporter and market leader in the Colour Bank segment. The company exports to well-established markets in India, the Maldives, China, Australia and Myanmar and today, occupies a niche market as the provider of quality customized paint solutions for a range of painting needs, having won several prestigious awards for quality and innovation over the past decade.